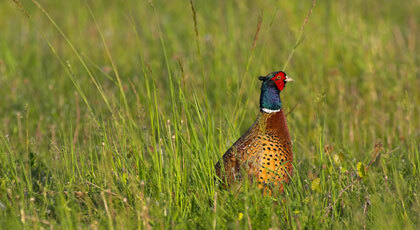 Pheasants are well adapted to the Romanian climate. They are found abundantly at altitudes between 0 and 300 meters, where the forests are relatively small or where there is bushy and reedy vegetation. The hunting season occurs between October 1st and February 28th. The most popular hunting method is the beat/driven hunt. Another hunting method is hunting with dogs, which can offer unforgettable moments.